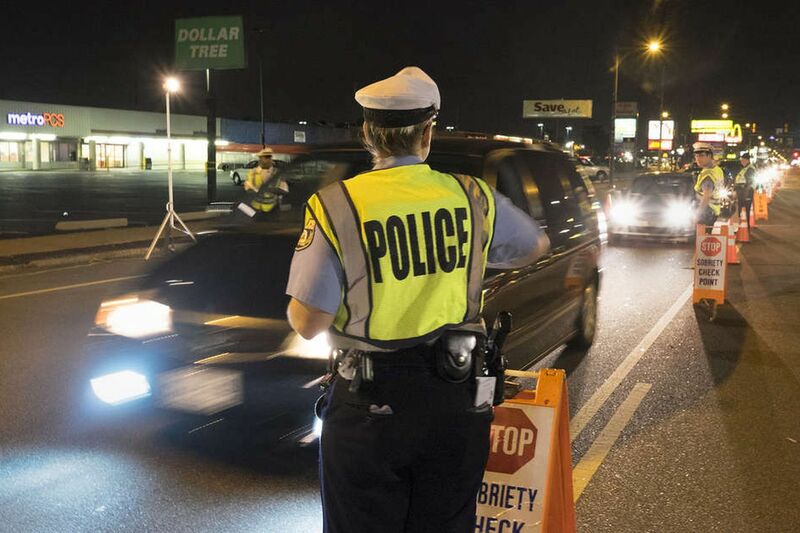 Philadelphia police set up a late-night sobriety checkpoint on Aramingo Avenue. It wasn’t the first time Mount Airy Casino Resort was penalized for violating rules on alcohol consumption. But this time, the consequences were far more costly. State regulators on Wednesday levied a $252,000 fine against the Mount Pocono, Pa., casino after a car driven by a patron who was served eight drinks in less than two hours struck and killed a jogger while driving home. The fine was magnified because in 2017, the casino was fined $27,500 and promised to limit patrons to three drinks an hour and to install an alcoholic beverage tracking system after a drunken patron fell off his barstool. The beverage-monitoring system was not installed at the time of the 2018 driving fatality. The Pennsylvania Gaming Control Board on Wednesday approved the fine without comment. The casino’s lawyer, Michael D. Sklar, declined to make a statement to the board. The gaming board’s case is laid out in the eight-page consent agreement in which the patron is identified only as “MG.” Court records and media reports identified the driver as Marc Graves, 53, of East Stroudsburg, who pleaded guilty in October to vehicular homicide while driving under the influence and was sentenced to three to six years in prison. A server delivered five beers and three shots of liquor to Graves while he played poker between 12:22 a.m. and 1:51 a.m. on Feb. 28, according to the consent agreement. He later moved to a craps table, and a blackjack table before departing the casino at 7:28 a.m. The casino told regulators that “at no time did MG stagger, sway or trip or show any signs of intoxication.” The valet runner who retrieved his car said Graves did not appear impaired. Less than 15 minutes after leaving the casino, Graves’ car struck and killed Lorraine Hamel, 55, a dentist, as she jogged along Route 940. Troopers who took Graves into custody said he smelled strongly of alcohol. The gaming board levied a stiff penalty because the casino had not lived up to an agreement it made in 2017, after a patron who had consumed 27 drinks in nine hours toppled off his barstool. Casino executives told the gaming board they were going to install a new software system, by July 2017, that would track the number of drinks each patron consumed. “We have also changed our house responsibility guidelines where if a guest consumes three drinks within a one-hour period, the beverage server is to contact a beverage supervisor to assess the situation," Boris Kostikov, the casino’s executive director of food and beverage, told the gaming board.